…you’ll love this video. Especially if you’ve tried the new beta. So we get to play Halo 3 beta for three weeks only from the 16th May according to BBC. Boo hiss. Three maps is surprising though. Just a shame the beta is on at the same time as Forza 2 is released. More info on Bungie site. Gears of War – where’s the depth? Gears of War (GOW from now on) is a fantastic looking game – not seen anything on the 360 that gets close. Some of the textures and effects are very realistic. Loving the rain in act 3! The single player mode has got me gripped more than I expected and certainly more than Halo 2. Online co-op adds so much to this game. Playing through chapters with friends over the last few nights has been great – hopefully more games in future will allow you to play any level via co-op. The look and feel of the levels so far (half way though the game) has been varied with some stunning cityscapes and architecture on display. You can easily see the influence that cities and in particular London have had on the game. Lack of story. Yep – thats a positive for me. I’d rather a company focused on gameplay and good content throughout the whole game than a good story, great cinematics towards the start and then a rehash of old content and textures towards the end of the game as publishing deadlines start to bite. Weapons! The chainsaw on the gun is inspired – I’ve still to tire from killing and covering my screen in blood. The active reload of ammo is also far better than I expected. As you reload you need to time a button press to get a faster reload and increased ammo power. Miss it and your gun will jam – get it right and you do more damage. On paper it sounded really tacky. In practice it makes for a great feature that adds to the pressure in the heat of the battle. Online has been fun. Loving the destructible furniture and the encouragement of good team play. Been some great finishing moves to the matches too. Biggest and loudest is multiplayer. Three measly options which are all derivatives of team deathmatch. Through play we tend to end up only playing warzone which really is team deathmatch. Online Maps – although there is a fair number there isn’t much variation, probably due to the style of gameplay. Hide, shoot. Hide, shoot. Hide/Camp, chainsaw. Best way to play the game is with friends. Can really take advantage of people’s strengths and weaknesses and employ some tactics. Think a slightly dumbed down Ghost Recon or Rainbow Six. So it’s good to know that I can’t play ranked games with friends. Only with randoms. Thats very poor, especially when ranked games with friends is rumored to be a feature being worked on while another story said you couldn’t do ranked games with the True Skill features in Xbox Live. Thats just bull. Ultimately a lack of depth. Although I’m enjoying the single player mode and co-op, and online has been fun, I’ve been finding it a bit tiring after an hour or so. Very samey gameplay with not much variation. It’s got some teamwork depth but thats about it. Halo was is far more satisfying. Forward rolls are the new jump. I remember when Perfect Dark Zero came out. rejoice – people can’t jump. True but they can forward roll all over the place. Has lead to some quite bizarre fights with 3 or 4 players rolling, shooting, rolling away, taking stock, rolling, shooting etc etc etc. What a pain in the arse. Far more annoying than jumping. Downloadable content is inevitable. How much? Should you buy the game? Absolutely. Fun will be had, the single player mode rocks and the online side is fun but limited. Just don’t expect to be playing this in two years time. A recent interview with Bungie shows why I think Halo 3 will still be the game to beat on the 360. Can’t wait. I guess it’s not a big stretch to expect Halo 3 to launch around this time next year but there was some news today of upcoming developments. 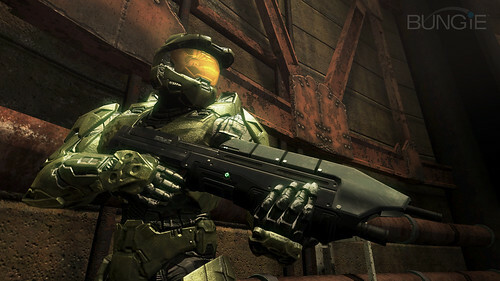 Firstly there’s a multiplayer Halo 3 demo coming next spring and to wet the appetite a new screenshot was shown. More of a surprise is that there are new maps for Halo 2 coming next spring. I still regularly play and enjoy Halo 2 so it’s great to see a more than two year old game get extra content, even if it is paid content and a final chance to extract some money from Halo 2 players. The only restriction is that you need a 360 to enjoy the new content. Reading about the Xbox Live anniversary brought back memories of my first time on Live. I was beta testing the UK service and it was a Friday afternoon when I first plugged in the headset and booted up the beta Moto GP. I had no idea what to expect so picked a random game (there were only a few available) and joined. Only three people in the room, one of which was a Climax developer. This was amazing. Silky smooth, no lag although it felt a bit odd talking to other gamers. The next Moto GP session had around eight players. Still great although the voice chat was brought to a crashing, jarring stop. ‘Who’s that fanny thats in front’ could be heard…from the mouth of a wee Glaswegian ned. Unmistakable. ‘Oot the way ya prick’. Ouch. Funnily enough those two sessions sum up all thats been good and bad about Xbox Live. Great online gaming with real and virtual friends with the occasional (slightly more than occasional on Halo) annoyance of some wee turd running his mouth off. Americans in particular. Still, it was a revelation and revolution that is now being copied by Sony and to a certain extent Nintendo. Console gaming just wouldn’t be the same without it. For all the abuse that Microsoft received (and still gets) it should be applauded for bringing out Xbox Live. Roll on the next four years. Still makes me smile…heard a guy singing this during a Halo match except it wasn’t ironic to him. Nice video to accompany the Team America song.